So you’re considering an Edge; good timing. Ford has updated their 5-passenger midsize SUV for the 2019 model year to keep it a compelling choice. Though most Ford shoppers opt for the smaller Escape or larger Explorer, the venerable Edge is still a big volume player for the brand. It has staying power, name recognition and has long since received positive reviews from me. Built upon Ford’s CD4 platform which also underpins products such as the Fusion and Lincoln Continental, this 2nd generation Edge debuted for the 2015 model year and moves into 2019 refreshed with a new look and host of new features. So the 3.5-liter V6 is no longer, replaced across the board, with the exception of the sporty ST, with this 2.0-liter turbo making marginally more horsepower than before and working through a new 8-speed automatic producing relatively impressive fuel economy of 23mpg on regular unleaded. Rated at 250 horsepower and 275 pound-feet of torque on 93 octane, a little less when running on the recommended 91 and minimally acceptable 87, this twin-scroll EcoBoost engine continues to be a satisfying fit here delivering the refinement of a larger displacement motor with the advantage of besting its competitors at the gas pump; thanks largely to the 2019 model’s additional 2 gears, a new all-wheel drive disconnect feature that automatically shifts power from the front wheels to all 4 wheels in a fraction of a second as conditions necessitate and improved aerodynamics including active grille shutters that open and close as needed. However, its 426 mile driving range is down a little from last year because this Edge carries a smaller gas tank. The Edge has distinct personality traits that make it an enviable SUV, including its soft, supportive front seats, a commanding view driving position that’s reminiscent of a minivan’s with its more upright nature and a very supple ride quality accompanied by relaxed yet precise driver controls that clearly communicate premium. The cabin is very quiet too which always helps push the luxury narrative. This loaded Titanium trim adds in just about everything a premium SUV owner could want including a wireless charge pad, panoramic roof, heated and cooled seats and a hands-free foot activated liftgate. But when you offer a safety suite called Ford Co-Pilot360 Assist + and it doesn’t include a 360 degree camera!? So you get a 180 degree camera but that’s it. New safety tech like Post-Collison Braking is standard and this Edge includes extra features such as Evasive Steering Assist and Lane Centering that gives the driver a little help staying on the straight and narrow when using the Adaptive Cruise Control with Stop and Go. So there’s a multitude of electronic helpers here but still not as many as I’d like to see at this lofty price. The updates have helped both the exterior appearance and to a lesser extent the cabin ambiance where this Titanium trim possesses a premium feel in terms of super comfortable seats, high quality leather and hushed quietness but it is still missing a handful of goodies that show its age – no heads up display, no drive modes, no all-wheel drive lock, no sliding rear seats, no rear USB ports or window shades. And at $48 those omissions are not acceptable just ask the Hyundai Santa Fe. I also miss having an automatic brake hold feature for times when I’m stuck in traffic to give my right foot a rest. The new rotary gear shift is cool, the changeable ambient lighting is a conversation piece and the 12-speaker B&O Play premium audio system is a nice get. There’s also a foot-activated liftgate, excellent cargo room, remote seat switches and some underfloor storage. But even with the panoramic roof, the cabin feels a little dark and claustrophobic. 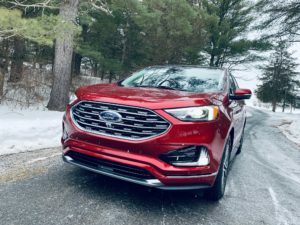 So while I appreciate the edgier styling, 20” wheels, and gorgeous Ruby Red paint and love the comfort the Edge provides along with its tuned riving acumen, fact is that the new Hyundai Santa Fe Ultimate is exceedingly more modern for $8,000 less. That’s a big price difference for the nuanced advantages the Edge provides. I really do like it, but I’d like it a lot more for about $40,000. If this Titanium AWD Elite Package is too rich for your blood, the 2019 Edge starts at $31,000 with 4 trims levels available.